I started playing with the code that has gathered up in the 3d-Models forum thread in Worldwind. Basically dumping it into eclipse and running it, ultimately I want to load complex DXF models. But the dxf format is not simply faces/vertices/edges, so will require more digging around and understanding. At least Autodesk has a free viewer to make my life easier and check while I make progress. The same can't be said about other 3d formats. They also make the awsome 3ds-MAX, so I can possibly use that as a format converter. One of my friends recently launched a digital arts initiative and I decided to check out the mapping arts program she had talked about previously. 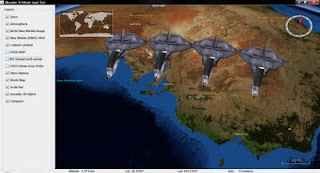 It makes heavy use of the Google maps/globe API and the google earth browser plugin to produce a content control interface via flash that the standard Google Earth would be lacking. Quite ingenious. The bit of the program I especially like is the geek in residence concept. Now this is a rather personal interest thought - but making maps and making maps pretty is a fusion of art and digital technology. We even had a presentation in FOSS4G about making maps pretty. I would love to see a geek-art collaboration in this domain. In a comedy of errors I managed to completely lose access to a machine. Underlying hardware windows IP stack got taken over by a Linux stack in a VM with bridged IP ( I spoofed the host by assigning the same IP to the guest VM). I had perfectly inaccessible system (via network) with a windows machine pretending to be a linux machine for all intents and purposes. Then I found an article on security through virtualization and spoofing, exactly what I had done by mistake. Here comes some more penicillin. I finally got my BIL/DDS code out and can start proving my community module to extensions status by writing some code coverage tests. Currently attending geoserver optimization workshop. Since Geoserver is such a nice implementation of the OGC standards, I decided to include WorldWind .bil format elevation output to it. The deployment of data is a breeze, just point geoserver to your file. There is already imagery output as .dds plugin written by an enterprising french man, but it requires maintainance. I will probably take over both of this "Map Producers" and get them tested and maintained as part of core geoserver. Then we will have a proper Java WorldWind stack from serving to consuming and displaying. While in a backpackers in Hobart , checked out and waiting for transfer to airport, I picked up a really thick book I had no hope of finishing in the time left - enter the "Infinite Jest". It was even harder to get through , reading it feels like swimming through treakle or may be the non-newtonian fluid, the faster you try to go through the more you get lost and are left unable to continue. I have finally managed to procure it from the library and gone thorugh first 2 chapters - I have been forewarned about the non-linear nature of the book. So I will read it in a non-linear fashion and collate on the fly (yay for TCP). Let's see how that works out. Another Wallace work is coming out in film this year - Brief Interviews , might read it first. The good thing about anthologies is that you can read them in bite sized bits .. lovely.